Life has been pretty hectic lately for me and I'm glad that I'm only a few days away from my island holiday! I don't have any planned itinerary in mind for this trip but one thing for sure, we'll be getting plenty of vitamin sea! All we want from this super impromptu trip is just a getaway from busy working schedule and enjoy ourselves with the sun, sand, and sea! Though we are less than a week from our trip and it didn't stop us from last minute shopping with PinkNProper to get our beach-ready swimwear and floaties! 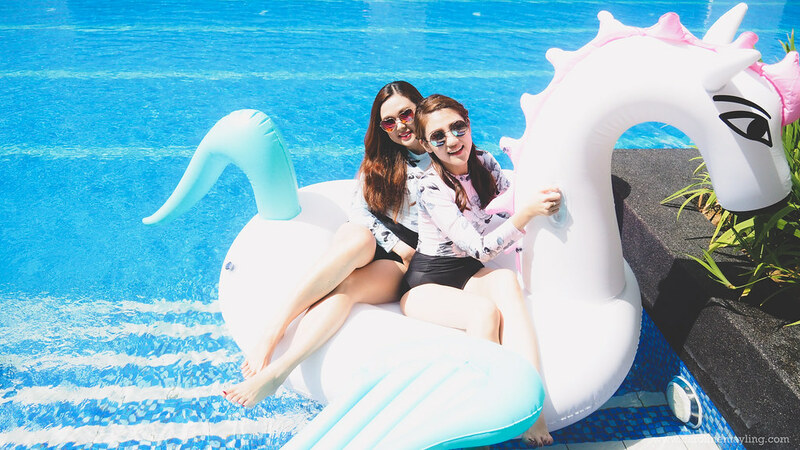 Whether you are looking for the basic or fancy swimwear, PinkNProper has it all and I am already fell in love with some of the pieces from their new swimwear collection! This is probably my most favorite piece from the new collection - Itzel Aztec Bikini Set - with the Aztec-infused print and bright color that totally perfect for your summer beach holiday! I don't have that perfect body shape for bikini, but it feels right wearing this one! Well, you can never go wrong with off shoulder, rock it whilst it still in trend! The best part about this piece - Meliora Off Shoulder Bikini Set - you can pair this bikini top with your favorite shorts or maxi skirt whilst taking a stroll on the beach or for that romantic dinner by the beach. Of course, if you're looking for something basic like the one I wore here, you can get it on their website too - Max Azria Cross Back Bikini Set! Tell me how this piece - Ephyra Pastel Pearl High-waist Bikini Set - is not cute! It's pastel and with the adorable seashell shape, with a little bit of pearl details here and there , it's just perfect! You might want to check out the rest of the high-waisted bikini collection HERE! I didn't expect myself to fall in love with the long-sleeved bikini, but hey some of these, you are able to wear it on its own or with the long sleeve top together! It's all up to you whether you wanna dress it up or down. And oh, they're perfect for that BFF-twinning-kinda-shot too! No more boring pool or beach time with all the new floaties collection! It would be crazy for me to post up all the pictures here, so it's better for you to check out the entire floats collection HERE. Not to forget all these adorable drink holder floaties! You can now get them in a set - 3 for RM59 only! Well, that's not all, you can get pretty much all your beach holiday essentials from PinkNProper including beach wraps, tote bags, etc! ps. One can never have enough swimsuits!